Will the Broncos or Panthers win Super Bowl 50? As usual in professional football, this question will get answered by the quarterbacks, Peyton Manning and Cam Newton. Put bluntly, it’s the old man versus one of the most athletic human beings in the world. If you didn’t follow sports, you would never guess which one of these guys is being investigated for PED use. However, both teams have excellent defenses as well. How do they match up against Manning and Newton? Let’s break it down. The real matchup in this game is the Broncos’ defense against Cam Newton. I would say the Panthers’ offense, but he’s the only above average skill-position player. As noted in my conference title game preview, the Broncos have the top ranked defense by yards per pass attempt and sack rate, both adjusted for schedule. (They’re slacking against the run, ranking only 2nd best in the NFL.) However, Cam Newton presents an entirely new problem. Not only is Newton bigger than most linebackers, he’s one of the fastest quarterbacks in the NFL. I have little doubt that Von Miller, DeMarcus Ware, and others can flush Newton from the pocket. However, can they then tackle him? I thought the Cardinals had their chances to tackle Newton in the NFC championship game but were not able to bring him down (or tackle any one else on the Panthers offense). I don’t foresee the Panthers’ wide receivers beating the best pass defense in the NFL on initial routes. However, they could make plays if Newton has or creates time to throw. Covering wide receivers may be the hardest job in the NFL. The longer corners are required to cover, the harder it becomes. The Broncos must contain Newton and make him throw into coverage earlier than he would like. On the other side of the ball, the Panthers’ defense will not have the same worries. Peyton Manning is as immobile as they come and his arm strength has diminished. To my surprise, the Broncos came out throwing the ball more than expected last week. Manning protected the ball well, took his sacks when pressured, and did just enough to win the game. Though I’m still not a huge believer in the Panthers’ secondary, the front seven is solid. They will be able to sit on under routes and short crosses that Manning prefers these days. Despite the Broncos’ shortcomings on offense, there is still value on their side in this game. Pinnacle opened with the Broncos as a 3.5 point underdog, but that number has moved as high as 6. It has settled at 5.5 on Tuesday before the game, while The Power Rank’s member numbers makes the Broncos a 1.1 point underdog. The difference between the computer projection and the markets is the current state of the Broncos. They’re not as strong as earlier in the season. The recent play is determining the point spread more than season-long statistics. The question becomes whether or not we should trust recency bias or season-long statistics. I’d prefer to look at the season as a whole, but I can see the case for expecting a blowout in favor of the Panthers. Personally, I lined this game closer to the open (Broncos +4) and am willing to play it at the current number. With both defenses being very stout, I am expecting a closer game than the Panthers’ have seen lately. It would not surprise me to see the line get bumped back down towards +5 or +4.5 at sharper books. Not to mention, backing the opposite of the public favorites in the NFL has proven to be profitable. Coming back from behind will prove difficult for the pedestrian Broncos’ offense. They will need to get ahead or keep the game close in the first half to have a chance in Super Bowl 50. I’m willing to entertain both narratives of this game. Seeing Newton growing into a superstar with relatively no help on offense has been incredible. Manning likely has one foot out of the door, and I wouldn’t mind seeing the old man go out with a ring. 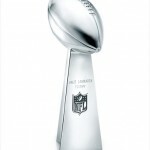 Unfortunately, if Manning does get his ring, it will be a similar story as the AFC championship game. We will credit Wade Phillips’ NFL best defense and incredible game plan to contain Newton. Otherwise, it’ll be another disappointing playoff scenario for Peyton and the near perfect season for the Panthers. Which teams will make the Super Bowl? New England travels to Denver as a 3 point favorite. This goes against the numbers, but a strong subjective adjustment suggests that the markets have this one correct. The story is different for Arizona at Carolina. A look at the match ups and injury situations go against the home favorite Panthers in the NFC championship game. Let’s take a closer look at both games using the ensemble predictions available to members of The Power Rank. Both the Patriots and the Broncos have played two different seasons. Both teams started the season on fire, then struggled down the stretch. Though their win-loss record didn’t take a big hit, the Broncos didn’t quite fit the part as the number one seed in the AFC. They’ve been flip-flopping between an “injured” Peyton Manning and the youngster, Brock Osweiler. The defense kept the Broncos a consistent force all season. Despite, to be fair, awful play at quarterback by both Manning and Osweiler, the Broncos won important games down the stretch on their way to the number one seed. What made the number one seed possible for the Broncos? The Patriots’ struggles. After starting 10-0, the Patriots finished the season 2-4 as injuries affected the offense and the secondary struggled. 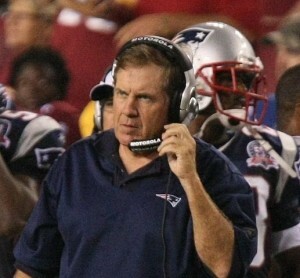 In my opinion, the Patriots didn’t exactly try to win the last two games of the season. They kicked off in overtime against the Jets and only threw the ball a handful of times against the Dolphins. 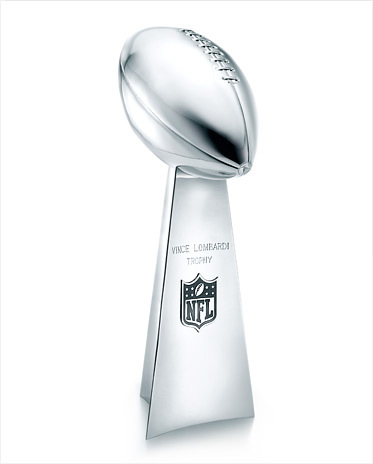 I would agree that avoiding the Steelers as the sixth seed was a better opportunity for the Patriots to reach the Super Bowl. With the Broncos knocking off the hobbled Steelers last weekend, this week is an even better opportunity for the Patriots. The Patriots offense is suddenly healthy. With Danny Amendola, Julian Edelman, and Rob Gronkowski all appearing close to 100% last week, Tom Brady ripped apart the Chiefs’ solid defense and silenced many doubters (including me). The discrepancy in The Power Rank’s prediction (Broncos by 3.8) and the actual point spread (Patriots by 3) likely comes from the way these teams are trending health-wise. The Patriots statistical struggles down the stretch could be credited to both not exactly attempting to win games and preserving health for this very moment. This current Patriots team is much closer to the team that started 10-0 as opposed to the team that closed the season 2-4 while losing to Brock Osweiler in overtime. Though the Broncos’ defense is extremely stout (the best pass defense and sack rate in The Power Rank’s ratings), quarterback play will hold back this team. They rank just 19th in pass offense and yards per carry (both adjusted for strength of schedule). I have sympathy for those currently backing the Broncos this week. There is some line value on a team with a great defense getting 3 points at home. But the uncertainty at quarterback position is frightening. If you are a follower of The Power Rank, you know that rushing ability does not predict wins or losses. The Broncos must be willing to throw the ball on the Patriots’ secondary if they want to stay in this game. Seeing that they were not willing to throw the ball against the Steelers awful secondary last week, I would not back either team of these teams. Point spreads are pretty efficient this time of the year and I don’t see the number coming off of three on either side throughout the week. At 3 points, I’ll pass on the side and enjoy the last of the Brady-Manning rivalry that we’ve been blessed with for so many years. A Cardinals-Panthers matchup is the most we could ask for this NFL season. These teams are very similar on paper and the point spread would suggest they are equals on a neutral field. Both of these offenses are extremely talented, exciting, and efficient. Both defenses rank in the top twelve in the passing game. Lastly, the most underrated portion of this game is the aggressiveness of coaches Bruce Arians and Ron Rivera. Though they have beat them twice, the Seahawks are by far the best team the Panthers have played this season. Their own division was very weak and their schedule-matched division this year was the NFC East. That combination alone led to an opponent 47-65 record. The Panthers did beat the Packers, but we can all admit it wasn’t the typically strong Green Bay team. Overall, Carolina only played two teams in the top half of The Power Rank’s member rankings: Seattle and Green Bay. The Power Rank’s advantage for the Cardinals comes from pass offense, 1st in the NFL, against the Panthers pass defense. After accounting for strength of schedule, the Panthers pass defense is merely average, 16th in the NFL. I would agree with this assessment. Outside of Josh Norman, the Panthers secondary is questionable at best. Robert McClain, Cortland Finnegan, and Roman Harper are all liabilities when trying to cover Larry Fitzgerald, John Brown, and Michael Floyd. Admittedly, Kurt Coleman has had a huge year with seven interceptions; however, this appears to be more of an aberration when you consider his previous seasons. Let’s not downplay Cam Newton’s talent, either. He’s lost a total of one game this season while scoring loads of points despite being the only offensive threat on the team. You’ll have to forgive me as this is also my concern. When looking at the matchup for the Cardinals secondary against Ted Ginn, Devin Funchess, and Kevin Norwood, I can’t say Cam has the upper hand this week. Playing at home certainly does help. But if you’re giving me the entire three points with a good quarterback, the better secondary, and much better receivers, I’m going to take that every time. I may not agree that the Panthers should be underdogs in this game at home, but the whole three points is too many. You can follow Frank Brank on Twitter. What’s the NFL without a little controversy? All news is good news for the NFL. The more folks blowing up social media on the missed pass interference call in the Cowboys-Lions game only made more tune into the game. Overall, I had a pretty solid Wildcard Round last week. Many of the outcomes ended up being as predictable as I had thought. This week will be a little more difficult as the teams get better, the weather gets worse, and the lines get tighter. The first game of the week renews the heated Flacco-Brady rivalry… just kidding. The Joe Flacco in the Playoffs narrative continues after the Ravens beat the Steelers in Pittsburgh last week. Though his team’s record is impressive in recent years, let’s not depend on a small sample of games spread out across multiple seasons. Flacco will undoubtedly regress towards his career expectancy. Flacco hasn’t played well on the road in his career. In 56 home games, Flacco has completed 61.7% of his 1740 passes for 7.56 yards per attempt (78 touchdowns, 35 interceptions). In 56 road games, he drops to 59.5% completion rate on 1907 attempts for 6.45 yards per attempt (70 touchdowns, 55 interceptions). Those road numbers compare to teams like the 49ers, Titans, and Jaguars from this year. For what it’s worth, I quickly scrolled through home/road splits of other quarterbacks like Tony Romo, Peyton Manning, Tom Brady, Ben Roethlisberger and even Andy Dalton without finding a home/road difference even close to Flacco’s. In addition, he will face New England’s 11th ranked pass defense and 12th best sack rate. That’s quite the step up from Pittsburgh’s abysmal secondary and pass rush. The Patriots offense, ranked 6th by The Power Rank, also has a favorable match up. Tom Brady will draw the Ravens league average pass defense (15th). Baltimore does make up for the secondary by getting after the quarterback. The Power Rank predicts they sack the opposing quarterback on 8.25% of pass attempts against average pass protection. The issue, of course, is Tom Brady doesn’t take many sacks. New England gives up a 3.7% sack rate against an average pass rush, second best in the NFL. If you’re backing the Ravens because of Joe Flacco’s recent playoff success, you should look at the difference in his home and road performance. He doesn’t play well on the road compared to other quarterbacks. Markets opened this game at Patriots -8.5. With some money coming in early, this line was adjusted moved down to Patriots -7. This game is appropriately lined given the Patriots home dominance over the last decade; however, there’s some clear line value any time you can get an underdog north of seven points. Baltimore is still getting the slim majority of the bets, so this line has a small chance to get under seven points. The value would then be flipped to the Patriots. I’ll take the Patriots to win with comfort and hope the Joe Flacco in the Playoffs story is put to rest. The Panthers and Seahawks couldn’t be further away in the standings. However, they play similar styles of football with an aggressive defense and run first offense. Throughout the season, the Seahawks executed that style better since they had 12-4 regular season record versus the 7-8-1 mark of the Panthers. Continuing with the similarities, each of these teams have played some cupcake games recently. Seattle finished the season winning six straight games with two games against quarterback-depleted Arizona, two against San Francisco, Philadelphia, and St. Louis. Carolina has won five straight against New Orleans, Tampa Bay, Cleveland, Atlanta, and a quarterback-depleted Arizona. Nonetheless, these are still professional football players and no opponent should be taken for granted. The Panthers and Seahawks each have elite defenses. The Panthers defensive numbers are a little skewed as they’ve gotten healthy as the season has progressed and have played much better as of late. According to The Power Rank, they still rank 13th on defense with the seventh best pass rush. Sacks have disrupted Russell Wilson and the Seahawks offense all season (8.8% sack rate). I don’t believe this is a knock to the offensive line; Wilson has held onto the ball entirely too long. Lacking a real threat on offense could be the issue. The Seahawks traded away Percy Harvin, leaving Doug Baldwin and Luke Wilson as the most dangerous weapons on offense. Wilson has been able to improvise with his legs; however, there is no doubt in my mind that Luke Keuchly will be spying him all game. The Seahawks offense, ranked 17th, should struggle against a fast, opportunistic Carolina defense. The Panthers offense will be in a similar situation. The Seahawks, who also struggled on defense at the start of the season by their standards, have worked their way up to the fifth best defense per The Power Rank. Cam Newton has played better lately, but I expect him to have similar issues as Russell Wilson in this game. Newton certainly has more weapons at his disposal, but he’ll also oppose the better defense. The books have lined this game at Seahawks -10.5 after opening at Seahawks -11. This game should be much closer than that. Even with the Panthers playing much better lately, 56% of the public has laid all those points with the Seahawks. I simply don’t think the Seahawks can score enough points to cover a double digit line. I’m going to go out on a limb and say the Panthers have a good chance to win this game with such limited scoring. One big play can change the outcome. The Cowboys narrowly scraped by last week, as we thought they might, with a little help from the referees, of course. The Packers had a week to rest, which should only help them continue their home dominance. The Packers have a ridiculous offense, which you don’t need me to break it down. The Cowboys also have a great offense, so where is the edge for each team? For starters, the Cowboys defense is not very good. I was supremely impressed by their second half against Detroit. They shut down the running game, pressured Stafford, and held the Lions offense to three points. However, the Cowboys defense was terrible in the first half against Detroit. If they lay an egg in either half of this game, Aaron Rodgers will take advantage and put them away early considering the Cowboys defense ranks 27th in passing defense and 29th in sack rate. The Packers defense may have similar issues. Though the offense started slow last week, the Cowboys have roughed up even the best of defenses, including the Seahawks in Seattle. According to The Power Rank, Green Bay’s defense now sits 24th in passing defense and 17th in sack rate. They have certainly been better than Dallas, but it’s not a wide margin by any means. Even with temperatures expected to be around twenty degrees at game time, I expect some points. The books expect the same with a total of 53, only trailing the Broncos-Colts total by one point. Having an opinion on this game is difficult. I really do trust Green Bay’s home dominance, but I also trust that they will give up some points. There’s certainly a chance the Cowboys hang in there and win this game, but I wouldn’t bet on it. The Power Rank has the Packers by a touchdown and I agree with that number. The betting line is also hovering around Packers -6.5. On a neutral field, these teams are very close to equals. At Lambeau, I’ll take the Packers over any team. This is a rare game where the hot and cold of the Cowboys isn’t swaying their betting line. If you’re going to take a side, grab the Cowboys and the points, but the books got this one right. Many thought the Colts were in trouble after the closing weeks of the regular season. However, their offensive line dominated the Bengals pass rush in their Wildcard game and gave Andrew Luck plenty of time to find his speedy receivers. The Broncos got the week off they desperately needed. They have some injuries on their offensive line. Even the Bengals horrendous pass rush was able to exploit those soft spots up front. The Broncos face a good Colts pass rush ranked 9th in sack rate adjusted for schedule. They also have a good secondary, as the Colts pass defense is very underrated at 10th in The Power Rank. The Broncos front will be better this week than in recent weeks. Though it’s a tall task with his quick releases, but if the Colts front seven can disrupt Peyton, they might have a chance to win this game. Ed and I have talked previously and agree that the Broncos are a better team, at least statistics-wise, than they were last year at this point. 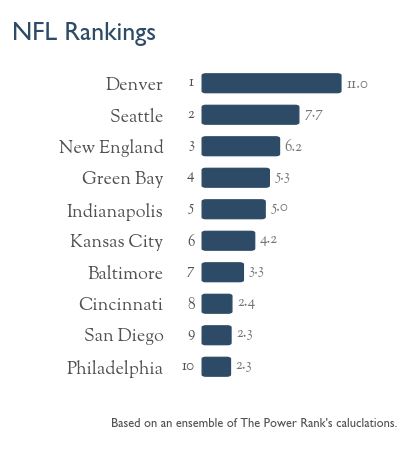 The Broncos are the top ranked team in The Power Rank and have the second best pass defense with a strength of schedule adjustment for yards per attempt. Peyton Manning still has the best overall protection with the aid of his quick timing routes and the best passing attack. Very few would question that. The questionable part is their now run-happy offense. C.J. Anderson has emerged as one of the better power backs with added quickness in the league. Realistically, though, Peyton Manning should be throwing the ball more often, as he leads the top ranked pass offense. If the Colts want to survive and advance, they’ll need to get to Manning. It’s that simple. If he has time in the pocket, Manning has proven for nearly two decades that opposing teams have a very small chance to beat him. I don’t foresee the pressure being sufficient and expect the Broncos to win comfortably. The books have lined this around a touchdown. The Power Rank likes the Broncos by a little more with an ensemble prediction of -8.6. The difference is the key number of seven points. You want to be on the correct side of that number. I can live with laying 6.5 points with Denver. You probably won’t see less than a touchdown anywhere, though. I also wouldn’t be opposed to taking the points at Colts +7.5. I really can imagine two of the underdogs, Panthers and Cowboys, winning this week. I would rank them in that order of likelihood, as well. The Panthers being double digit dogs may disagree with me, but I love the match up. With no games inside of 6.5 points in Vegas, they are suggesting a pretty boring Divisional round. However, we know well enough the playoffs are always exciting. Sports have insanely random outcomes in the one game samples you’ll get this week.